At the aggressive rate technology is advancing, many of us may be closer to our dreams than we realise. It need not be a large noble dream, but a simple wish like wanting to record every single moment of your child’s growth. For me, I have many dreams and ideals. 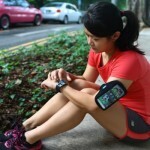 One thing that I really want to achieve is to be able to work on the go efficiently. As an independent, I manage different jobs for different clients and I’m often out and about, sometimes even overseas. Lugging the laptop around is a little tiresome thus I only bring it out for interviews, but there is something that would make things a lot easier – a tablet! It falls between the PC and the phone, so it’s a good fit… Not too bulky like the laptop, yet not as limited as the phone! 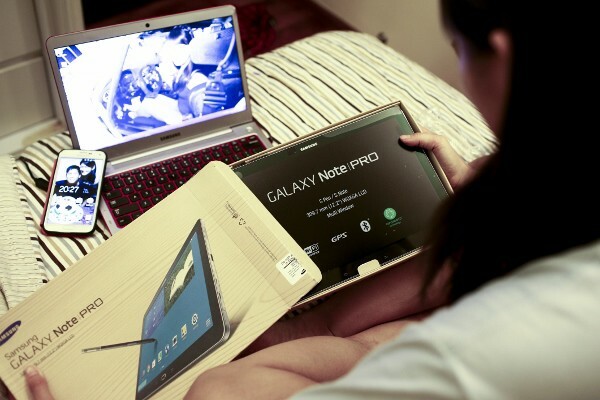 Helping me to fulfil this dream is the Samsung Note PRO (12.2” Display) LTE, one of the latest tablets from the brand. It functions similar to a laptop and is a lot easier to carry around. You can now achieve your dreams with the Samsung Dream Exchange, a campaign that encourages consumers to step forward with their dreams and turn them into realities with creative uses of technology through Samsung products. 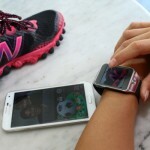 For example, you may want the NX mini so you can take the best selfies to document your life journey, the Samsung Curved UHD TV so your ageing grandparents can watch the World Cup in the clearest and best resolution, the Gear 2 to help you with your fitness goals, or travel the world with the Samsung K zoom to capture moments and immediately post to Facebook. 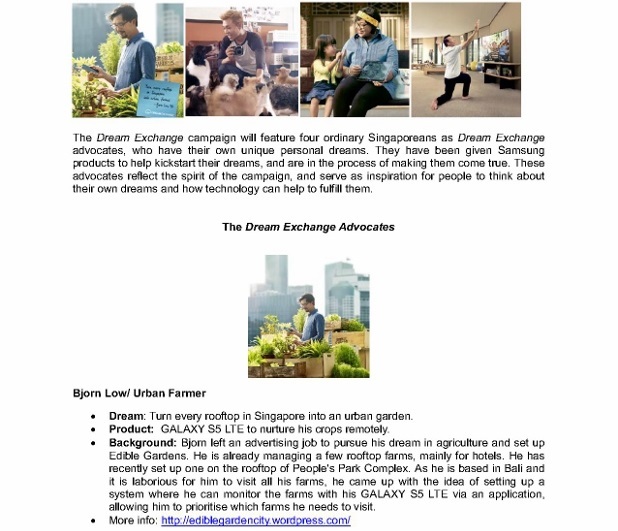 From 1 July to 8 August, all Singaporeans and Permanent Residents (PRs) can submit their dreams (in 125 characters) at www.dreamexchange.com with the specific Samsung product to help fulfil it. 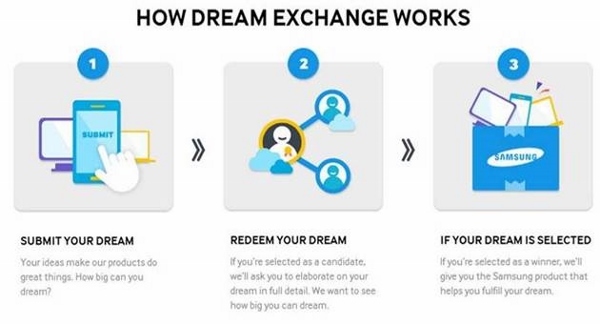 Remember to use the #DreamExchange hashtag and you need to have a valid Facebook or Twitter account too. 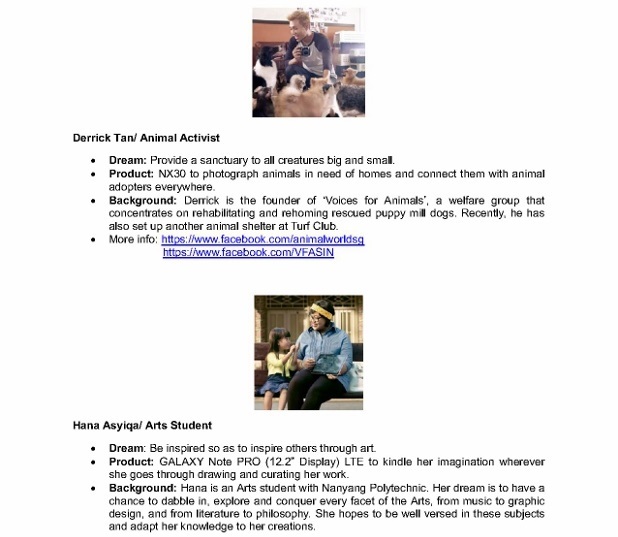 Alternatively, you can go down to Orchard Road on 5 and 6 July and also 12 and 13 July to submit your dreams on the spot with Dream Exchange roving ambassadors. There will also be a Dream Exchange truck at Chevron House, Raffles Place from 14 to 18 July. 50 dreammakers will have their wishes come true at the end of the campaign. Yes, these 50 selected winners will get the Samsung product of their choice to help them achieve their dreams! Winners will be notified via social media. You can watch all their individual videos here.